While I’m not at all in favor of the NFL’s desire to start a new franchise in London (sorry Brits), I am totally in favor of the NFL moving the Eagles remaining four home games to London, Mumbai, or even Guam for that matter. Perhaps that’s what it will take to salvage the season. What seemed like an anomaly has now grown into a “scarlet letter” of sorts for this franchise…ten straight losses at home, a feat not even accomplished during the lean years of the 60’s and early 70’s when this writer was not even part of the world population. With each loss, the ire of the fans grows, as the Eagles approach the NFL record of fourteen straight losses at home. On Sunday, the Eagles continued their offensive ineptitude, moving slower than an automobile trying to meander its way down the hairpin turns of San Francisco’s Lombard Street. If you’re keeping score, the offense has scored exactly three points in two games, and even that was because of a gift DeMeco Ryans interception that gave the Birds the ball at the Cowboys 30 yard line. Yes, that is the actual Jaguars song (whatever Jacksonville marketing guru came up with that should be fired), second only to their “We Are….Jaguars” chant. No wonder they’re a losing franchise (personally, I’ll stick with my alma mater’s “We Are..Penn State” chant). But going back to the Birds, what was once a promising situation at quarterback has now turned into a conundrum. This past offseason, after fourteen seasons with Andy Reid at the helm, the Eagles decided on a “No Reid option”, vying instead for Chip Kelly and his “read-option” offense. But over the last two weeks, this so-called progressive offense has morphed into “read-optionless-injured”, with one QB hurt (Michael Vick), one recently concussed (Nick Foles), and one inexperienced (Matt Barkley). Speaking of Barkley, while I give him a pass for not having much NFL experience, I don’t give him a pass for stating that he played “okay”. One plays okay when the offense scores 14 or 17 points, not when you score zero points and you’re the quarterback for three quarters…OKAY??? So what happens when the Birds visit the “black hole” that is Oakland’s Almeda County Stadium this Sunday? Of course, the Birds win with my man Nick Foles at quarterback. That’s right…even after my whole diatribe above, the Eagles salvage the season and win this Sunday as long as Foles remains healthy enough to start. Bears at Packers 8:40 PM ESPN (Mon) – This is the perfect Sunday to finally rake the leaves that have been building up in your yard, as there is only one marquee matchup on the docket this weekend, and that is not till Monday night. The Bears started out 3-0 this season but have come back down to earth as of late (don’t they always? ), losing three of their last four games. The Packers, with Aaron Rodgers at the helm, are quietly leading the NFC “Snowbelt” division at 5-2. My prediction – there will be frost on the cheese. If I had told you before last week’s Eagles – Cowboys game that the Cowboys would score only 17 points, many in the Delaware Valley would have bet their house, their 401K retirement savings, and their kids’ college fund on an Eagles win. But as a certain commentator on ESPN always says, “That’s why they play the games!”. For the last game and a half, Nick Foles had been as accurate and steady as they come while filling in for the injured Michael Vick. But at approximately the stroke of midnight Monday morning Kazakhstan time (1 PM EST), his “accuracy carriage” turned into a pumpkin, as he looked disillusioned and just plain disoriented while running the Eagles offense, resulting in a 17-3 loss that may be looked at three months down the road as the game that kept the Eagles out of the playoffs in 2013. To add injury to insult, Nick Foles, who usually makes wise decisions, chose to hold the ball and get sacked on one particular play instead of throwing it away or running out of bounds, resulting in a concussion which will keep him out of Sunday’s game and possibly cause him to lose his starting job, which was his for the taking. Rookie Matt Barkley came in to try and rally the Birds in the 4th quarter, but his three interceptions would probably have had Borat (and Eagles fans) spewing obscenities that I cannot repeat in this PG rated blog. As Broad & Pattison turns, so does the Eagles quarterback carousel, as Michael Vick, suddenly healthy once again, gets his chance to win back the job he supposedly never lost as the Birds face the Giants this Sunday at the Linc. 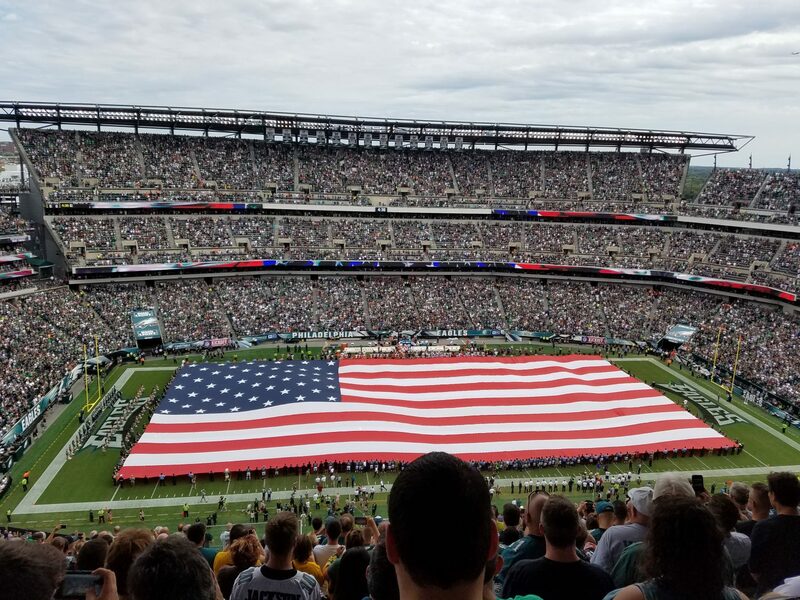 Much has been made about the Eagles nine-game home losing streak, with many suggesting that the venue is to blame for the lack of a home-field advantage. But while the rugged, blue-collar environment of the old donut-like Vet has been replaced by the wifi, the solar panels, and the EZ-Pass like concession stands at the Linc, it’s not as if the fans are sitting on their hands discussing Obamacare, the recent government shutdown, and the rise in their small-cap mutual funds while the Eagles are going for it on 4th down. No, the reason for the Eagles woes at home is twofold – after they beat the Giants at home on Sept. 30th, 2012 to go to 3-1 on the season, they managed to win only one game the rest of the season as the team felt apart and finished 4-12. Simply put, they were just a bad team last year…home or away. This season, all three of their wins have come on the road but just look at the schedule and the picture is clear. The three teams they beat this year have a combined win total of three….an average of one win each between them. Contrast that with their three home losses, which are against teams that are averaging five wins on the season so far. Simply put, the Eagles have faced better competition at home. A win against the Giants this Sunday would not only snap the home loss hex, but would put the Eagles at 4-4 at the halfway point of the season…just where many thought they would be. It’s hard to say about this game…I think the Birds will prevail, but I speak more with my heart than my head. Birds win 24-20, but it’s not easy. With this team, it never is. Cowboys at Lions 1:00 PM FOX – Perhaps they should bring back Emmitt Smith and Barry Sanders for this showdown in Motown. Dolphins at Patriots 1:00 PM CBS – The Pats are leaking oil with all of their injuries so this may be a chance for the Dolphins to steal one. Jets at Bengals 4:05 PM CBS – The Jets have two of their four wins on last-minute field goals after “gift” calls from the officials. The Bengals may actually win their division this year. The Last Word: In the “weird stat” department, the last time the Eagles won a home game, none of the coaches of the four major sports teams in Philadelphia (Phillies, Eagles, Sixers, Flyers) held their current jobs. Most likely, the scruffy, bearded man on the classic NFL films video had probably downed one too many Schmidt’s beers in the Veterans Stadium parking lot before professing his disdain for “America’s Team”, the Dallas Cowboys. Or maybe he could have been drinking Schlitz or Miller High Life as well. But his statement echoes the sentiments of many in the Delaware Valley…we just love to hate the Cowboys. The feeling is really not mutual. On the two occasions that I’ve been to Dallas (once at the old Texas Stadium in 2004 and again in 2009 at the new Cowboys Stadium), the fans have been nothing but nice, though the detractors would say that it is really a “phony” kind of nice. I’ve never hung around in the “Metroplex” (as the Dallas – Ft. Worth area is called) long enough to know which opinion is accurate. So why do we hate Dallas? Perhaps it is the smugness with which the Cowboys conduct business. Perhaps it’s Jerry Jones and his larger than life persona (though we hated the ‘Boys in the days of Tex Schramm and Tom Landry as well, when Jones was still a young tyke poking his head in the ground and searching for oil). Or perhaps it’s the title of America’s Team, coined by NFL Films Editor Bob Ryan when working on the team’s 1978 highlight film. Which begs the question…are you really America’s Team when you’ve only achieved one playoff win in the last sixteen seasons? During that same stretch, the Eagles have won ten playoff games if you’re keeping count. I know, I know, the ‘Boys have five Super Bowl rings while we still have a big , fat goose egg, but if you haven’t won a Super Bowl in the last ten years, how many you had in the past is irrelevant as far as I’m concerned. But whatever the reason may be, on January 11, 1981, the Eagles exercised their demons and years of futility by beating Dallas in the NFC Championship game, 27-10, which to this day remains the only time the two teams have faced off in the NFC Championship game. It is also the Eagles only postseason win (out of four tries) against the Cowboys. And while we are only in Week 7 of the NFL season, this week’s game will be huge, if only for the fact that the winner will be in 1st place in the NFC East with a 4-3 record, in a division where 8-8 could win it. While the Eagles, with Nick Foles at quarterback, have the ability to actually score in the red zone, the downside is that the defense will be hard pressed to stop Tony Romo, who is a far cry from facing a rookie like Tampa QB Mike Gleason, or an error prone Eli Manning. But with the home fans at the Linc hungry for a win and in a frenzy, and the accuracy of Nick Foles continuing, the Birds win this Sunday, 37-34. Seahawks at Cardinals 8:25 PM NFL Ntwrk (Thurs) – The Land of the Sun welcomes the Land of the Clouds in a rare Thursday night marquee matchup, though I’m coming around to the idea that weekly Thursday night football is not such a good idea. Bengals at Lions 1:00 PM CBS – An intra-conference battle as the Queen City visits Motown. Though coincidentally, did you know that many Chryslers are made in Ohio? Niners at Titans 4:05 PM FOX – Wonder if Colin Kaepernick and Jim Harbaugh will don cowboy hats and visit a country western bar after the game. Broncos at Colts 8:30 PM NBC – Peyton Manning goes back to where it all began, and where he won only ONE Superbowl. Andrew Luck has the Colts thinking Super Bowl earlier than anticipated. The Last Word – Speaking of the fans, the Eagles have lost eight straight games at home dating back to last year. To put that in perspective, an Eagles season ticket holder who’s made a financial investment in the team over the course of the last year (which usually covers eight home regular season games) has ZERO wins to show for it. Let’s change that this Sunday peeps! So it seems that my prediction for last week might have been just a little off, but hey, even “Nostrad-Amit” can be wrong once in a while (that is an understatement I know…my batting average on picks this year has been along the lines of “Chooch” without the help of Adderall). On a sun-splashed Colorado afternoon which would surely have had John Denver singing “Rocky Mountain High”, the Eagles were actually competitive for the 1st half, and down only 21-13 at halftime before acquiring a “flat tire” (no pun intended for you Colorado beer fans) and getting blown out in the 2nd half and losing 52-20 in what was surely a “rocky mountain low” on the young season for the Birds. Perhaps it was the thin Rocky Mountain air that did them in in the 2nd half? Or perhaps, in anticipation of the series-finale of the AMC hit TV series “Breaking Bad”, the Eagles decided to watch some reruns during the 2nd half and send out members of the Indian table tennis and badminton teams as replacement players. Coming to think of it, the Indian badminton team may have done a better job covering Demaryius Thomas and Wes Welker than whoever was playing in the secondary in the 2nd half. Got to give props out to Denver though…nice stadium and nice people (though I do prefer the intimacy of our 65,000 seat “LINC” over the 76,000 seat Sports Authority Field). This week the Birds face the Giants, and while in the past, this has often been a marquee matchup played at 4:25 or on Sunday night, this week’s contest marks a must-win for two teams that have one win between them. From a prediction standpoint, this game makes me uncomfortable. I know the Giants are 0-4. I know the Giants are aging. I know the Giants have a porous offensive line….which makes picking the Eagles just way too easy. Just like the Denver Broncos, sitting at 4-0, can’t continue to win forever (and I actually think the Cowboys will upset them this week), the 0-4 Giants, as bad as they are, can’t continue to lose forever either. With the G-Men playing in front of their home fans this week, I think they’ll unfortunately put together enough quality play to defeat the Eagles, 28-27, and send fans around the Delaware Valley asking all next week if Chip Kelly was the right hire. But as Yoda once preached patience to Luke Skywalker, we as Eagles fans will have to have patience as well (and a few more solid drafts) before this team will turn things around. The Last Word – At least in the “something good comes out of something bad” category, an Eagles loss will mean that Glen Macnow, from the WIP midday show with Anthony Gargano, will be forced to wear a dress on Monday’s show. Perhaps they can get Dustin Hoffman from “Tootsie” and Robin Williams from “Mrs. Doubtfire” and rename Monday’s show “The Three Amigas”? ?